Audience: Armed Professionals or civilians. This is a Pistol and AR-15 course for people looking for the knowledge and skill set to be able to operate their firearm if in the tragic case they incur an injury to an arm or leg. Scope: The curriculum is designed for students that have a working knowledge of their firearms and some experience shooting them. An entry level or first-time shooter will be overwhelmed in this course. 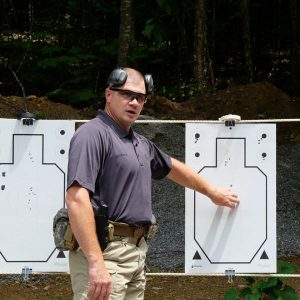 Instruction and practical exercises on the range will equip the student with a solid skill set and understanding of pistol and AR-15 manipulations while injured and possibly with only the use a single hand or leg. Student should be physically able to get up and down from standing, kneeling, supine and prone positions.